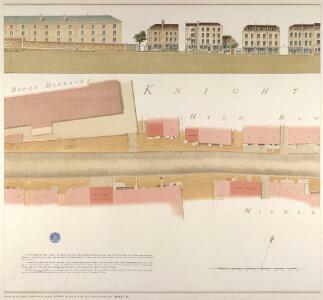 Description: The Horse Guard Barracks are depicted on the north side of Knightsbridge. Built at the end of the 18th century, shortly after the French Revolution, when the authorities feared insurrections at home, the barracks provided accommodation for 600 men and 500 horses. By the 1870s the barracks, considered too cramped and dilapidated, were pulled down and replaced by new buildings designed by Wyatt in 1880. In 1959 these were further replaced by Basil Spence's 270 feet high tower block. A milestone outside the barracks indicates half mile distance to Hyde Park Corner.